Andy: This rum has a very interesting aroma. Sweet, sugarary vanilla smell. Unlike any rum I have encountered. It is a little harsh drank straight, but VERY flavorful. Mixed with Diet Coke this rum is delicious. Very sweet and unique. Even if you don’t like rum and coke, this rum is so sweet, you may want to give it a try. This rum is tasty and inexpensive. Definitely give it a shot if you can find it! 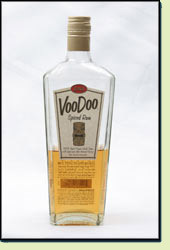 Adrian: Voodoo has a very unique rum smell…very spicy with some cinnimon. A little hard to drink straight but you can really taste the spiciness. It makes Captain Morgan Spiced Rum taste plain. I love the flavor and I would definitely keep this in my liquor cabinet. You had better appreciate a sweeter flavor of spiced rum if you want this.